The GEW Penn State team organizes events as part of an internationally driven initiative to join entrepreneurs from around the world. UNIVERSITY PARK — Global Entrepreneurship Week Penn State, organized by the Penn State Small Business Development Center, is set to bring entrepreneurs from campus and the community together Sunday, Nov. 12, through Thursday, Nov. 16. 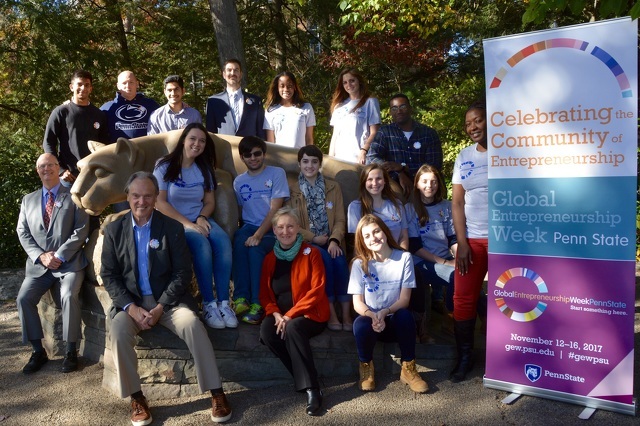 GEW Penn State is part of an international initiative with 15,000 partners in 170 countries. The goal is to connect entrepreneurs, investors, researchers, policy makers and startup champions around the world. GEW Penn State events will take place on 15 Commonwealth campuses — including University Park — where locations will extend into several entrepreneurial spaces in downtown State College including New Leaf Initiative, the Chamber of Business and Industry of Centre County, Happy Valley LaunchBox and Schlow Library. The Centre County commissioners signed a proclamation declaring the week “Global Entrepreneurship Week Penn State” and Michael Ryan, interim director for the Penn State SBDC, said the partnerships between Penn State, community groups and businesses have created an agenda full of dynamic keynotes and activities. More than 60 themed events, workshops and networking opportunities will take place throughout the week including “She Started It — A Documentary on Entrepreneurial Women,” “Growing your Company and Keeping True to your Startup Vision,” “The Art of the Possible,” “First Step to Starting a Business” and the return of CBICC Flavor Flights featuring local restaurants. PSECU will sponsor one of the keynote speakers and offer complimentary lunches for student attendees. Entrepreneur and Penn State alumna Erin Weidemann will share her experiences with future proprietors at the luncheon. Aaron Lamphere, founder of Lab 29, will participate in a panel discussion to share his path to entrepreneurship/intrapreneurship with others who may want to follow in similar footsteps. For a complete schedule of GEW Penn State events, visit www.gew.psu.edu.